For years, the best place to get that feeling on a regular basis has been Wavelength, a weekly concert series which is by far the coolest thing about Toronto’s music scene. For a few hours every Sunday night, Toronto’s freshest new bands — and some touring groups — perform for a pay-what-you-can price at the Garrison at Dundas St. and Ossington Ave. Wavelength is unique for a variety of reasons: it’s the old stomping ground of many of Toronto’s now-famous musical acts (think Broken Social Scene, Peaches and Great Lake Swimmers), it’s artist-run, it’s been around for over a decade and its original inspiration was rooted in organizing a community of like-minded, artsy music lovers while documenting local culture in a live music format. Genuinely so cool. And so sad that it’s coming to an end. Indeed, the last weekly Wavelength show will be on February 7. Wavelength will be moving to a monthly music format after that, but I implore you to go check it out in its original, weekly guise so you can get a flavour for local, current, Toronto beats the way they’ve been done since 1999. This week, see The Elwins, Tyson and the Trepids and, my personal favourite, Whale Tooth. Chances are, you’ll get to witness the birth of the next wave of hot new Canadian music, just by embracing indie pop on a Sunday night in Toronto. And make sure you’re in the audience for one of the handful of shows organized to celebrate Wavelength 500, the grand finale of the weekly series. The concerts run February 10 to 14 and feature a greatest-hits of Wavelength performers including Bruce Peninsula, Pony Da Look, Holy F*&k, The Bicycles, Constantines and many others. Get out more and get into the future. Leanne is an associate at Heenan Blaikie LLP. She spends her free time indulging in art, film, music and literature and swears that culture tastes better than chocolate. Her column will appear every Friday here on lawandstyle.ca. 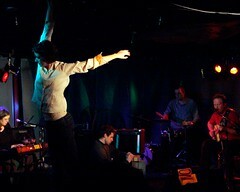 Photo of Toronto band Deep Dark United at Wavelength by John Maynard.